Outcasts of Empire unveils the causes and consequences of capitalism’s failure to “batter down all Chinese walls” in modern Taiwan. 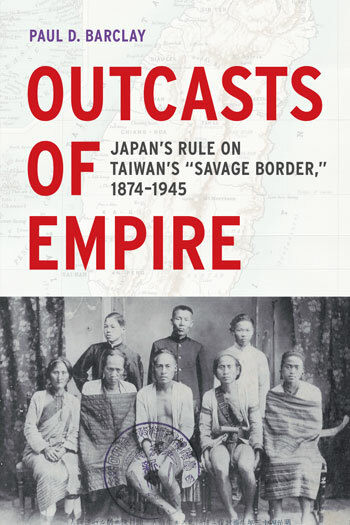 Adopting micro- and macrohistorical perspectives, Paul D. Barclay argues that the interpreters, chiefs, and trading-post operators who mediated state-society relations on Taiwan’s “savage border” during successive Qing and Japanese regimes rose to prominence and faded to obscurity in concert with a series of “long nineteenth century” global transformations. Superior firepower and large economic reserves ultimately enabled Japanese statesmen to discard mediators on the border and sideline a cohort of indigenous headmen who played both sides of the fence to maintain their chiefly status. Even with reluctant “allies” marginalized, however, the colonial state lacked sufficient resources to integrate Taiwan’s indigenes into its disciplinary apparatus. The colonial state therefore created the Indigenous Territory, which exists to this day as a legacy of Japanese imperialism, local initiatives, and the global commodification of culture. PAUL D. BARCLAY is Professor of History at Lafayette College. He is also general editor of the East Asia Image Collection, an open-access online digital repository of historical materials.